You’re being trained by the world to believe the false gospel of victimhood. 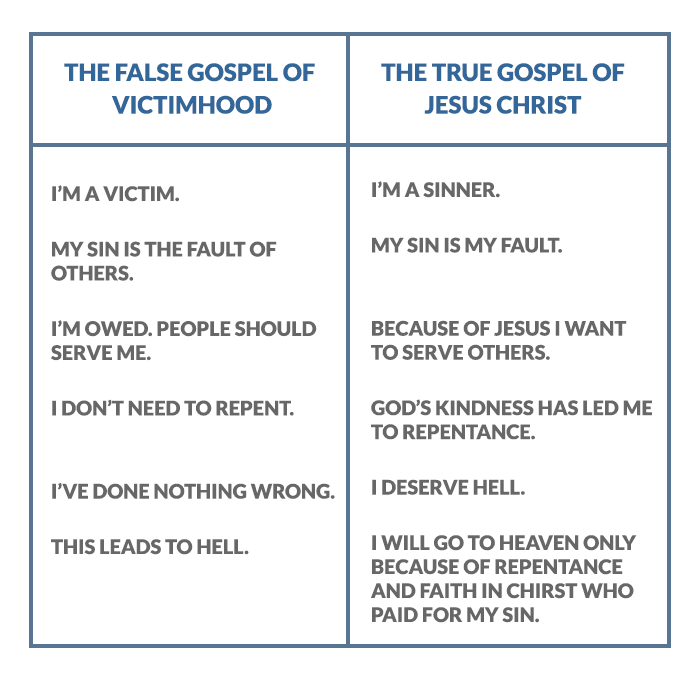 The false gospel of victimhood tells you that your sin is because of someone else, you’re a victim, and you can leverage your “victim” status to get what you want. This is harmful. You may have been sinned against badly by others, but you’re still responsible for your sin. You’re a rebel who needs grace. The false gospel of victimhood won’t give you grace. It lacks the repentance that Christ commands (Mark 1:15). The false gospel of victimhood focuses on blame over responsibility, entitlement over thankfulness, and it leads to hell over heaven. Young person, you must reject the false gospel of victimhood. Believe the Gospel of Jesus Christ! Our sinful nature is to blame others rather than take responsibility for our sin. This is nothing new. After the fall, Adam blamed God and Eve, and Eve blamed the Serpent (Gen. 3:12-13). Today is no different. People blame their family, situation, past, friends, church, youth group, you name it. Why? To shift the responsibility of sin onto others. Yet, this doesn’t escape God (Heb. 4:13). Each of us will die and face judgement (Heb. 9:27). Trying to clear your own sin by shifting blame will not erase your responsibility. It didn’t for Adam and Eve. It doesn’t for you. The solution is to repent. Take responsibility for your sins, confess them, and know that God is just and faithful to forgive (1 Jn. 1:9). How can God forgive you? Through Christ (Rom. 3:21-26). The false gospel of victimhood blames others by making excuses for sin. This digs you into a deeper hole of sin where there is no escape. The Gospel of Jesus Christ causes you to take responsibility, trust that Christ pays for your sins, and trust that Christ alone can pull you out of the hole of sin. Believe the Gospel of Jesus Christ! The false gospel of victimhood creates entitlement over thankfulness. If you always see yourself as a victim, then you will demand repentance from others rather than repentance from yourself. You won’t repent if you always see yourself as a victim who hasn’t done anything wrong. You will live feeling owed by others. Whereas the Gospel causes thankfulness. Thankfulness that Christ died and rose from the dead, so that through Him your sins are paid for. The false gospel of victimhood feels entitled. The Gospel of Jesus Christ causes thankfulness. Believe the Gospel of Jesus Christ! The false gospel of victimhood sends people to hell over heaven. If you’re always a victim, then what sin do you need to repent of? Why did Christ die? If you make little of your sin, then you will make little of Christ. If you claim you are without sin, then you are deceiving yourself and the truth is not in you (1 Jn. 1:8). The Gospel is giving rebels, not victims, unmerited favour with God through Jesus Christ. Victims don’t cry out in repentance for they’re victims who haven’t done anything wrong. Sinners cry out in repentance because they’re guilty in need of saving. The false gospel of victimhood lacks repentance. It leads to hell. Believing the Gospel of Jesus Christ leads to heaven. Believe the Gospel of Jesus Christ! The false gospel of victimhood destroys. The fruit of it is blaming others and self-righteous entitlement. This will lead to hell because it lacks repentance. The Gospel of Jesus Christ takes ungodly sinners, and by grace alone, through faith alone, in Jesus Christ alone, declares them as righteous in the sight of God (2 Cor. 5:21). The false gospel of victimhood kills. Jesus gives life. Believe the Gospel of Jesus Christ!